It's hard for me to explain how I love so many books in so many different ways, just like I love different people in different ways. It's all love, just not the same kind or the same amount or in the exact same way. It's about having a conversation that makes you want to lean in for more. It's where everything around you ceases to exist for a little while, and you become acutely aware of the cadence in the other person's voice, the nod of their head, the smile you share in agreement or when you both find something amusing. It's the companionship you feel when conversing and sharing a precious, quiet moment in time together,...just enjoying the pause from your normal, busy, everyday hustle and bustle in life. When the conversation ends, you go back to your everyday life more aware of everything. You appreciate the world around you more because you took a break from it for just a little while. You tell yourself you'll remember to slow down, drink more of life in, and be kinder to yourself and to those around you. It makes you see things in a softer, yet brighter, light. Yes, that's it. That's exactly what makes The School of Essential Ingredients, by Erica Bauermeister, a novel to be treasured. It gives me that same feeling I get from having a good conversation that warms my heart and makes me smile again and again. It makes me like myself, and the world around me, a little more. What a lovely gift to give to a reader! 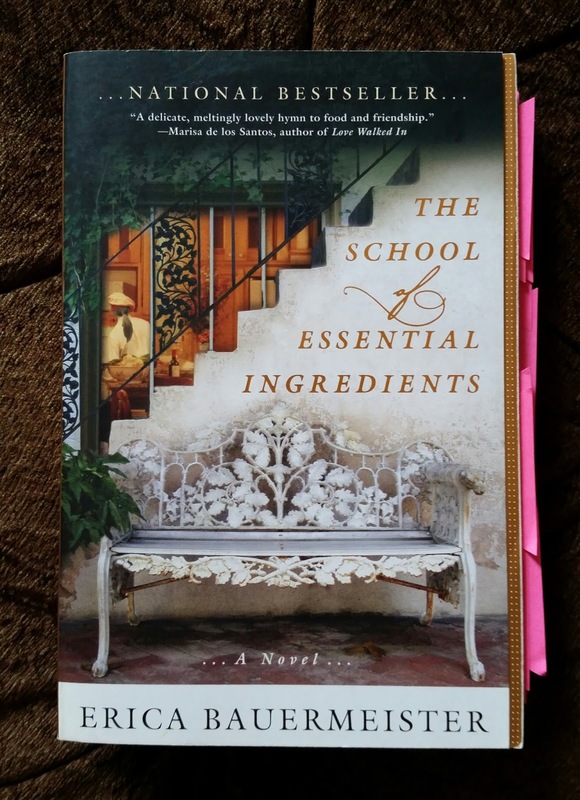 The story is built around Lillian, a fabulous cook and restaurateur, who pauses her life one Monday a month to teach a cooking class to eight students. The adult students are different ages and come from different backgrounds and lifestyles. Each character gives voice to the story, and you learn how they came to be there. The students learn much more from Lillian than cooking, they learn about each other and some precious truths about life. I also consider this book a treasure for another reason. I found it myself. It wasn't recommended by anyone, I'd never heard of it before, and it was one I was attracted to on a random hunt through a bookstore. (I love when that happens!) I've found I have an odd instinct for choosing great random books. I do seek out new authors and debut novels on purpose because I like to give something new a chance. Goodness knows, I read and appreciate the well-established authors and the classics enough. 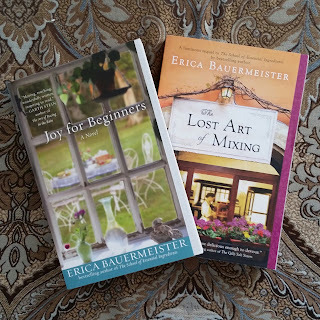 I liked Bauermeister's style so much that I ordered her other two novels. One is Joy for Beginners and the other is The Art of Mixing, which is the sequel to The School of Essential Ingredients. I don't believe it was originally written to have a sequel, but I'm glad she wrote one. I'm looking forward to finding out what happens to the characters in the next book. I'll be sure to let you know if the sequel turns out to be a lovely late-night conversation, as well.